By GreenEyedLillies on June 4th, 2009 . Filed under: Decorating, Gifts, Holidays . Don’t Forget Dad this Father’s Day…Sunday, June 21 2009! Drive dad wild with these colorful little golf cart cupcake sleeves. A fun way to celebrate Father’s Day and his favorite sport at the same time. Packaged in a mix of red, blue green and yellow. 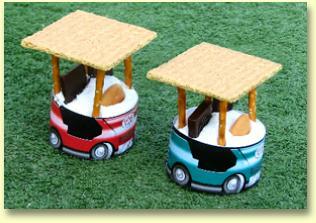 Top with cookies for seats, steering wheel and a roof and you’re ready for the fairway! Let your dad know he’s tops this year with something he’ll enjoy – and find quite delicious as well. 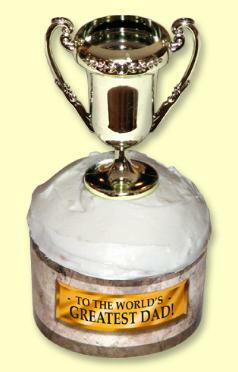 Give him a trophy cupcake using our Roundabout sleeve and a quick topping. Customize this sleeve below using the blanks. ‘To The World’s, Greatest Dad!’ is standard. 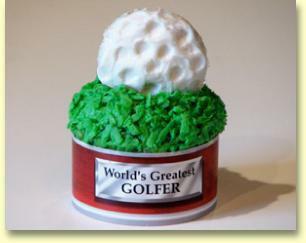 If there isn’t time to tee off for Father’s Day, there’s time for a fun golf cupcake instead. Increase the fun on or off the course with these clever cupcake sleeves. A fun way to play the 19th hole. ‘World’s Greatest GOLFER‘ is default or personalize it to Dad below. Available at Roundabouts™ Cupcake Sleeves. 2 Responses to Don’t Forget Dad!!! Check out the golf course! These would be great with it!